The government and Pakistan Tehreek-e-Insaf (PTI) committees are expected to meet today (Friday) to resume the stalled negotiation process. 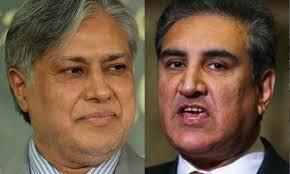 According to sources, Asad Umer and Shah Mahmood Qureshi will represent the PTI while Minister for Finance Ishaq Dar and Planning and Development Minister Ahsan Iqbal will form the government’s team. The modalities for the formation of a judicial commission and the definition of ‘election rigging’ will remain the order of the meeting to be held at PTI leader Jahangir Tareen’s residence. Meanwhile talking to a news channel, Jahangir Tareen said that though his party had called off its anti-government protest sit-in outside Parliament House, yet its ‘Plan C’ would stay its course until justice was served. “Let me also make it clear that we have not ended our sit-in after soliciting any assurances from the government,” Tareen said. The PTI leader said that putting aside all his differences PTI Chairman Imran Khan had sided with Prime Minister Nawaz Sharif in the most critical juncture in the history of Pakistan, adding the latter was expected to reciprocate the same gesture. “The PTI will not wait until a week for the government negotiations to start. They better come to terms with the fact that we have only shelved our ‘Plan C’ for now and not forever,” Tareen said demanding the government announce a judicial commission within two days. “In the event the government fails to meets its commitment, our ‘Plan C’ will automatically re-launch. And if needed then our ‘Plan D’, which is on the launchpad, will blast off,” he warned. Meanwhile, in a tweet, Imran Khan said that his party would only reconsider returning to parliament when the judicial commission gives its verdict on the rigging probe.